Accommodations. Optional all inclusive packages with activities available. All canceled reservations received 31 or more days prior to arrival are subject to a 50% cancellation penalty. The TOURS/SAINT-PIERRE-DES-CORPS train station is served by the TGV Atlantique high-speed train line with a constantly growing number of efficient connections to the capital: There are 16 round-trip TGV trains per day, and in less than an hour, you can be in the Paris city centre at the Montparnasse train station. From highway A85, take Exit 7 towards "Langeais/Cinq Mars la Pile". Follow in the Saumur/Azay-le-Rideau direction. Follow Azay-le-Rideau/La Chapelle aux Naux direction and cross the bridge of Langeais. The Batelière Sur Loire is located in Touraine, a province in France, and is 20 minutes away from Tours and only 2.5 hours away from Paris. Come to this property to escape the daily routine and discover the pristine accommodations offered by this properties. They are in close proximity from the Loire Valley, a UNESCO World Heritage Site and is even accessible by bicycle. Visit the Royal Loire Valley and view the grandeur of the Castle. You will be settling in the heart of a small village called La Chapelle aux Naux, an old fishermen's village on the banks of the Loire river. The village's harbor dates from the 19th century, allowing explorers and history-lovers to truly appreciate the beautiful surroundings. At this property, you will find wild, exceptional landscapes, which is ever-changing along with the seasons. This is a true paradise for nature-lovers, fishing-enthusiasts, amateur photographers, or bird-watchers alike. People passionate about beautiful rocks or unique tastes in foods will be equally satisfied by the tens of castles and Loire wine cellars. Also available are cabins on the riverbank or accommodations on the water, or right nearby the heart of the small village, where you can indulge in the pleasant old-school feel offered. After a long day hiking and exploring castles, or simply wine-tasting, come to the spa offered by the property and experience an authentic Touraine massage. The domain is equiped with a beautiful spa with a jacuzzi and a sauna to escape from the daily grind. Perched six meters high in the middle of a small wood, the hut is completely nestled in the greenery. You will wake up to birdsongs and will enjoy the south-oriented, sunny terrace. From there, with an open sky above, you will have a view over the foliage, and a little farther on, the church of this small village. Equipped with a double bed on a mezzanine, the Fisherman Treehouse is a cosy nest for lovebirds. Its small living room includes a double sofa-bed to accommodate larger families and has all the space needed to unwind. Want to stay for few days? No problem! The "Fisherman Hut" is equipped with a small bathroom and a kitchen area for you to prepare your meals, unless you prefer one of our gourmet baskets delivered to the foot of the hut. 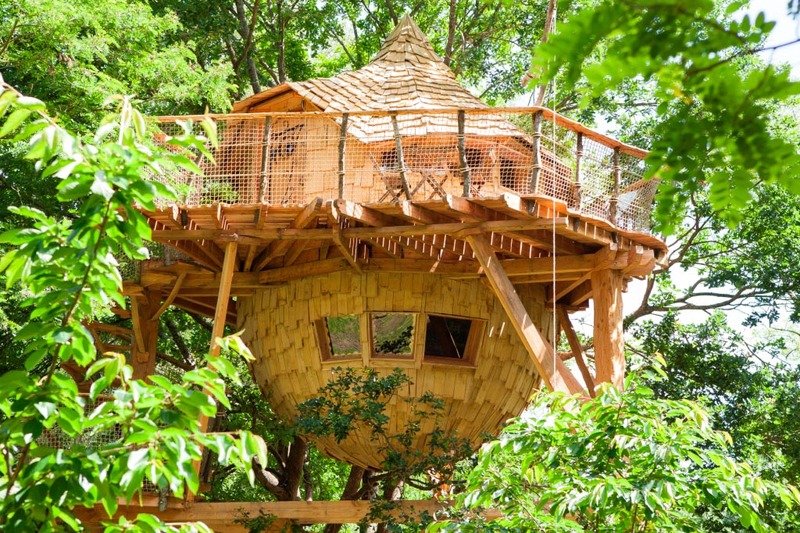 In the middle of three oaks, as in a real bird's nest, stands the Orchard Treehouse. The hut will transport you in a charming natural world, serenaded by birdsongs. You will enjoy your hammock chair, or observe birds from your bed, which is situated downstairs in the hut bowl, or enjoy your sunny terrace with a view of the domain’s orchard. Stay as long as you want in the Orchard Hut which is equipped with a small but real bathroom. And for your meals, you will have the choice between our optional baskets delivered at the foot of your hut and a list of excellent local restaurants. For two adults, La Toue Charme has a comfortable and cozy living, where you will be able to take time observing wild birds. On the front of the boat you will find a nice and sunny place to sunbathe; but you also can have a romantic candlelight meal there or spend hours gazing at the stars after having observed a marvelous sunset: a magic moment! And at night, you will fall asleep soothed by the water sounds as if you and your loved one are alone in the world. Thanks to the fully equipped kitchen area and the small but real bathroom with bio toilets, you will be able to extend your romantic getaway with your lover for several days. The boat can host two adults, and two children under 10 years old. From the living area, you can also observe a lot of birds, and even the special Loire eagle. During the day, the deck of the boat offers you a nice, sunny space for breakfast or lunch. There is also a kitchen and a modest bathroom with a shower and bio-toilets available on the boat, so you can extend your stay over a longer period of time. The boat is moored on the banks of the Loire, between La Chapelle aux Naux, and Bréhémont's Port. The boat has electric power provided by solar panels! Romantic and fabulously unique accommodations to fit your holiday needs.